Keep up-to-date with new products, special offers and get great money off with Coupon Codes. Join the silent revolution today!! E-Rider is the UK’s leading retailer of electric bikes, electric mopeds and electric motorbikes. We sell directly to our customers online to help keep prices as low as possible, and all our quality bikes are covered by a comprehensive two-year warranty. Normal delivery lead time is 7-10 days and standard delivery is free of charge. In the UK, the Government have said that they want to outlaw all vehicles which create carbon emissions by 2040 and the mission to achieve this has already started. Of course this means electric bikes and electric mopeds as well as cars. At E Rider we believe in all the great environmental advantages that electric vehicles can bring and we have brought together a great range of bikes. 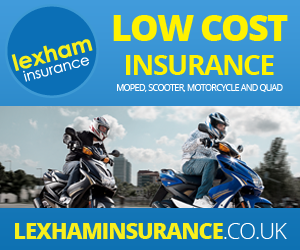 Because of the excellent lights and the motorbike suspension, our mopeds are much safer than a standard electric bike and are much smoother and more comfortable to ride. And of course when you purchase an E Rider you not only become a customer- you become part of the E Rider community. Join the silent revolution today!! !